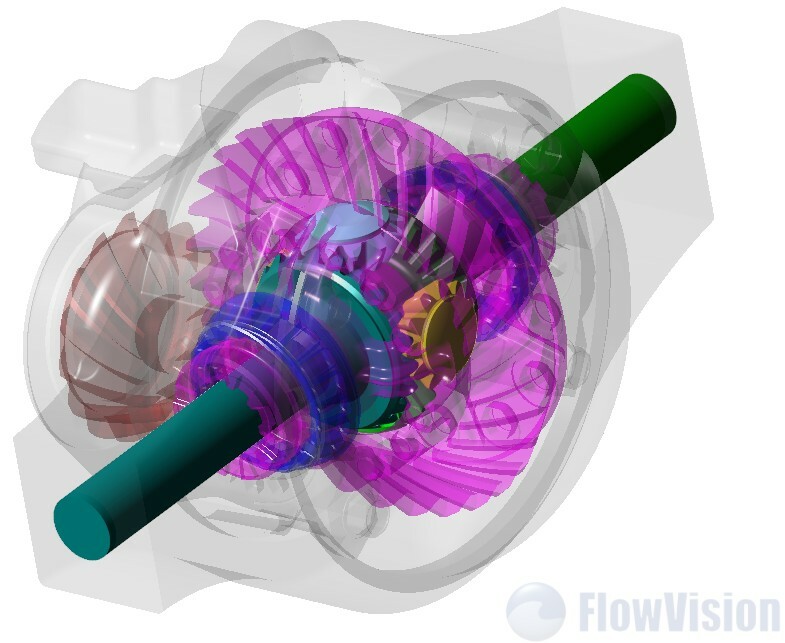 The CFD software package FlowVision was used for the most complicated calculations of oil distribution in the crankcase of the leading axle of the KAMAZ truck. This pilot project was successfully completed in close cooperation between the specialists of TESIS and KAMAZ. 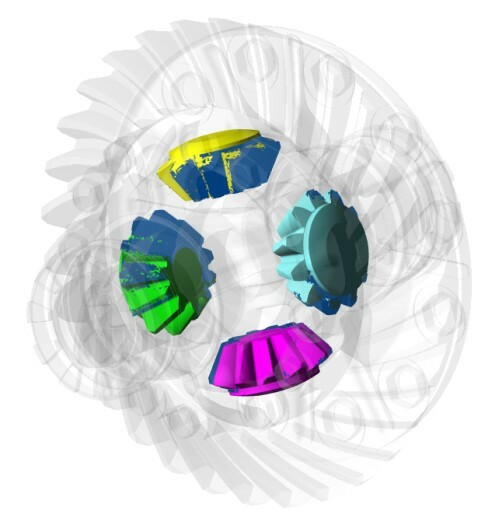 Based on the three-dimensional CAD-model of the crankcase created by the designers of KAMAZ company, the specialists of TESIS have developed a mathematical model which describe the flow of oil partially filling the crankcase volume under the action of rotating structural parts and gravity field. The calculations have been performed together for various modes of operation of the simulated unit differing in the operating temperature of the transmission oil and the angular velocities of the rotating parts, the driving and central wheels, and also the satellites. The analysis of modeling results carried out by specialists of KAMAZ and TESIS made it possible to trace the dynamics of movement and distribution of oil in the crankcase volume, as well as to evaluate the effectiveness of lubricating the surfaces of structural parts. Based on expert analysis of the results of calculations, conclusions were drawn about the adequacy of the calculated design model and the possibility of using the FlowVision software package to solve the issues and design basis for the lubrication of complex mechanical systems for KAMAZ vehicles. The developed approach gives the designer the opportunity at all stages of design to obtain and analyze reliable and comprehensive information on the characteristics of the lubrication system. Field of velocities in the calculated domain. 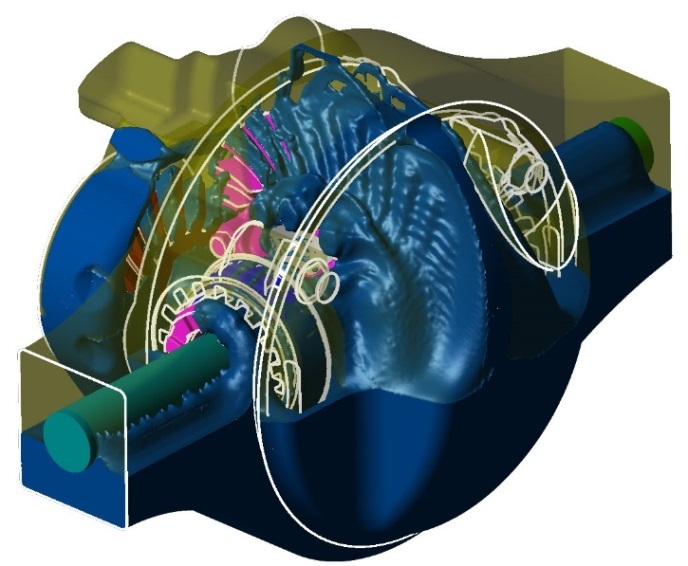 Based on the results of the pilot project, KAMAZ company and TESIS company agreed on further long-term cooperation with the aim of evolution a computational model and creating new modern methods for modeling physical processes based on FlowVision and ABAQUS software packages for use in the design of various KAMAZ vehicles.